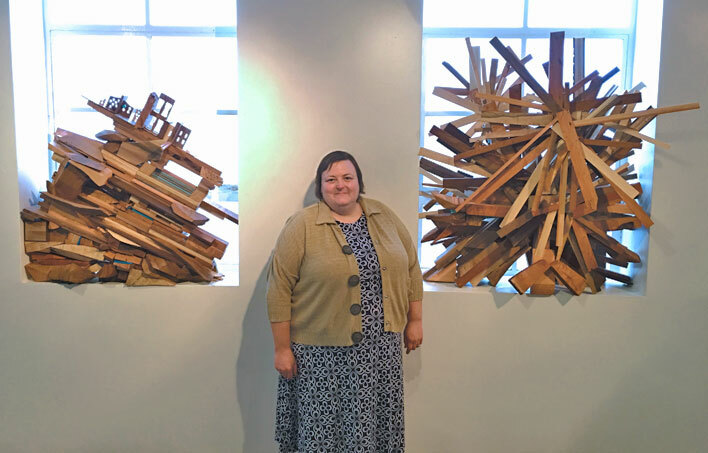 Rebecca Niederlander’s sculptures and site-specific installations are data visualizations of the ephemeral in life. Her labor-intense abstractions use repetition and the inherent nature of the materials to address the individual’s position within the larger intergenerational community; as well as the micro and macro nature of ego, and ego’s relationship to the necessities of solitude and boredom in the creation of individual thought. She also co-founded the social practice BROODWORK in which she curated, wrote, and designed actions and objects that explored the interweaving of the creative practices and family life—in particular, parenthood. She is married with one daughter. Mary Oliver wrote that “attention is the beginning of devotion.” I find lately that my practice is more and more about being a responsible devotee. Wood, paper, wire, plastic, whatever. Complicated individual elements are brought together precariously; they connect together, stressed by gravity and tension. They are completely responsible for each other. The more precarious the more their own mortality and their response to the stressors of existence mimics our own fleeting moment. I am a materialist in the truest sense of the word. I interrogate these materials lovingly and with great care. It is compulsive, this need for connection. I stand there, with you, be it in person or in spirit. I imagine that we both saw the little place where specs of dust had made a home. I am a spec of dust, as are you, but it is stardust. Every atom in our bodies came from a star that exploded. We are in the middle of our bodies, our families, our communities, the Milky Way. At its essence: Things fall apart and reconnect. I document it. 2008 Finesilver Gallery, Houston, TX. Catalog co-editor and author, It's About Time catalog for OTIS College of Art and Design, Los Angeles, CA. 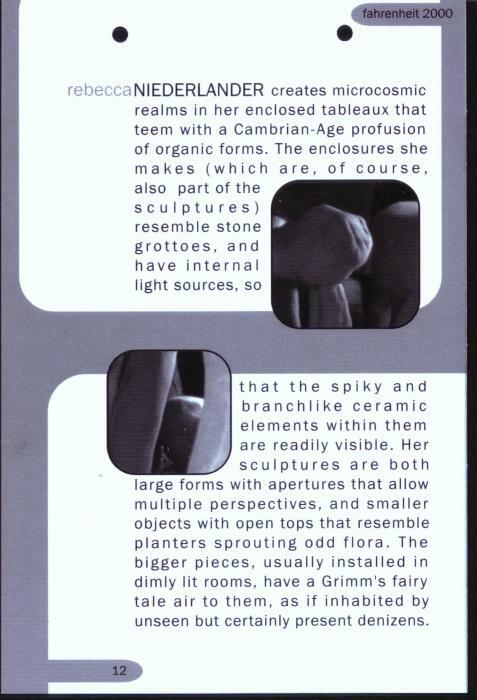 2007-09 Reviewer for ArtScene Magazine. Previews for Mark Dutcher, Ben Jackel, Kim Tucker, Klutch Stanaway, Contemporary Art From India, Jennifer Vanderpool. Sightseeing in St. Louis, and frequent reviews. 2004 Hieronymus Slept Here at Irvine Fine Arts, Irvine, CA. 2001 SuperPhat: Big-Time Innovation at Remba Gallery and Mixografia Workshop catalog essay for Superphat at Cypress College, Cypress, CA.